No, it does not sound like a marriage made in heaven. However, I’m not a stranger to having beer in early part of the day. When I used to live in North Melbourne, I lived with an excellent homebrewer who had kegs and taps and everything. I was living the drunkard poetaster dream. One morning (8am or so), two of us woke up to discover that due to roadworks in the area we had no water. We got water back at 3pm. Shall I let you connect the dots? So no stranger to beer and breakfast, I went along to the ‘Hair of the Dog’ Breakfast at Beer Deluxe hosted by beermen.tv. I’m an avid hater of long, talky podcasts (though beermen.tv are really a ‘vodcast’ – that term doesn’t have much popularity though) but indebted to Todd of beermen.tv for kindly e-mailing some beer tasting notes my way (the term ‘mouthfeel’ is actually starting to creep in to my beer vocabulary and it feels goooood). 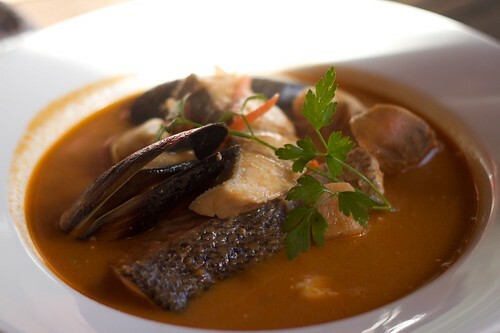 Being a little late, we were rushed through the door and sat down – it was a full house. Upon arrival, a glass of Mountain Goat’s organic steam ale, a beer I’ve enjoyed plenty of. Argue with me if you like, but this beer tastes markedly different on tap to what it’s like from the bottle and I prefer the latter. Don’t stone me yet though. 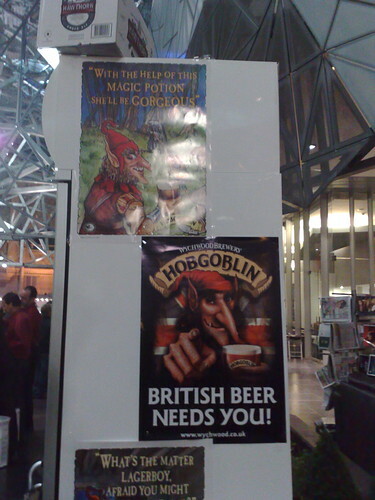 Better yet, go and buy a 6-pack of it to drink, and then pay the Mountain Goat brewery in Richmond a visit and compare. First course was already up as we rushed to our seats. Everything was too fast and furious for me to take notes on the dishes, so I’ve cheated and pinched a bit of info off James’ blog post whose blog you should all be reading anyway. I feel pretty guilty about this, so James, if you’re reading, I owe you a drink…or three *wink*. 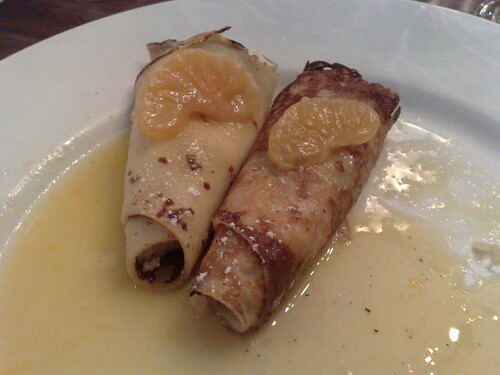 Behold, crepes stuffed with ricotta, mandarin and sultanas. Scoffing these down was easy as piss. I haven’t had stuffed crepes for ages. This was matched with the Razor witbier by Bright Brewery. Like James, I too do not jump for joy for at witbiers but they’re a damn fine start for breakfast. Would definitely buy a 6-pack for some good old session beer drinking. 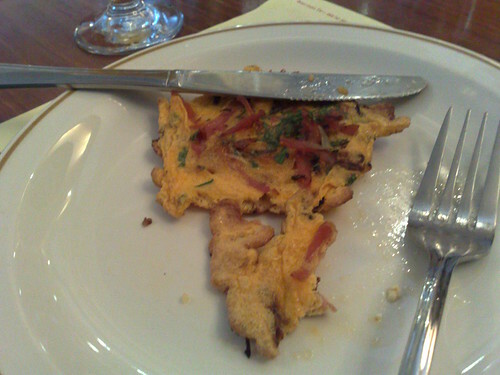 The second course was a slice of Spanish omelette with leek and prosciutto. I found this a bit dry and oily. Of course, that didn’t stop me from demolishing it. 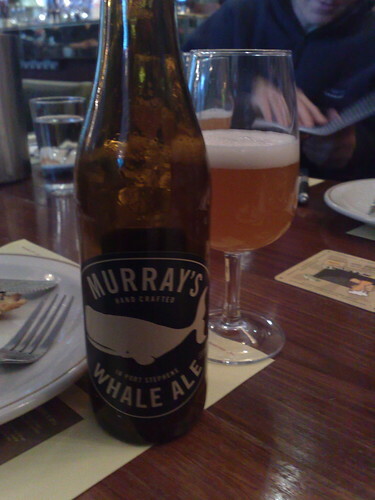 It was matched with Murray’s Whale Ale. There were jokes from beermen.tv fellow Mark that they chose this for its cute label, giggle. This is an American-style wheat beer, but it doesn’t have the characteristics of a traditional wheat beer that put me off. Quite a refreshing drop, and I would drink it again. For the third course of toasted rye bread topped with bratwurst and fruit chutney, we were given two beers in accompaniment. 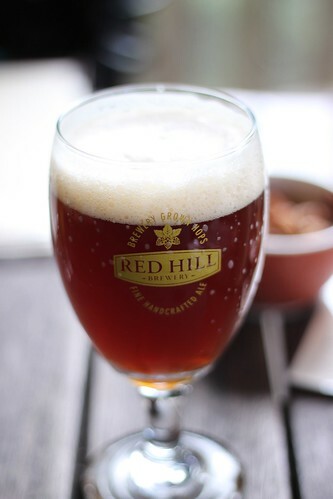 Pictured below with the course was Red Hill’s wheat beer (largely responsible for my palate deciding to give wheat beers another go). Apologies for the blurriness – the staff at Beer Deluxe were fantastically efficient! 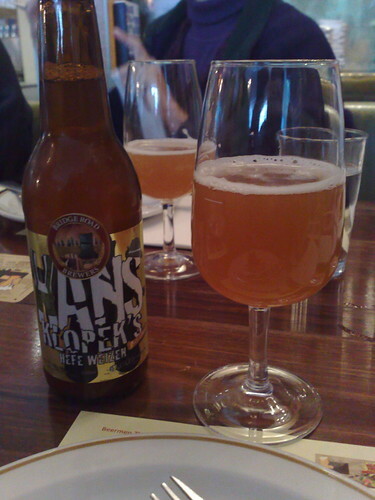 The second beer was Bridge Road’s Hans Klopek Hefeweizen. I wasn’t a big fan of the Bridge Road hefe the first time I tried it at a bar (at night, even). It seemed much nicer with food. 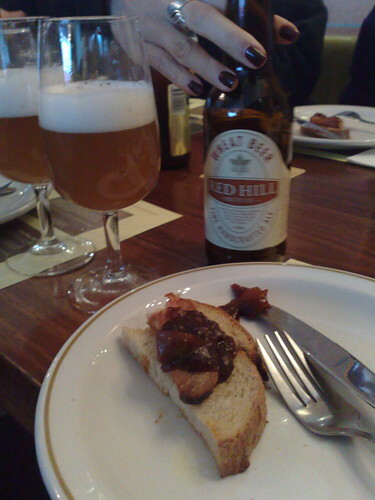 My favourite breakfast beer and food match was this course and the Red Hill wheat beer, the beer being one of my least favourite beers from Red Hill Brewery, incidentally. Lost count of the courses and beers yet? We had started with beers with an ABV of 4.5% and slowly moving up the scale to 5% and this was in the space of about, ooh, thirty minutes? Work, kidneys and liver, work damn you! I somehow managed to not get a snap of our fifth beer – Stone and Wood’s Stone Beer. I’d tried this the night before at the AIBA beer tasting in the Atrium, Fed Square and not liked it much. On this occasion, it was so much better. 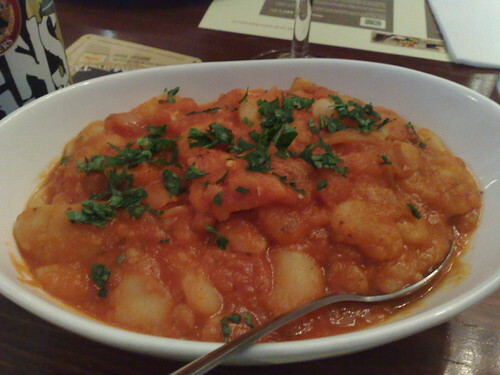 The fourth course nosh was baked lima beans with tomato and caramelised onion. 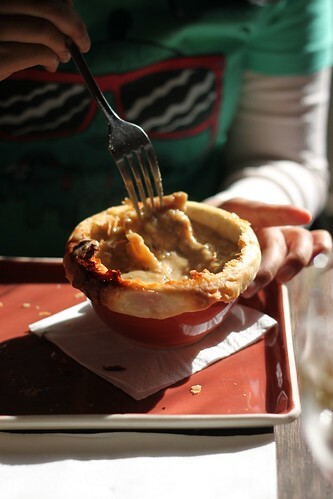 The servings of this were huge and enough for me to get seconds! I looooove beans and seems like not everyone on my table shared this love. Oh well, more for me! 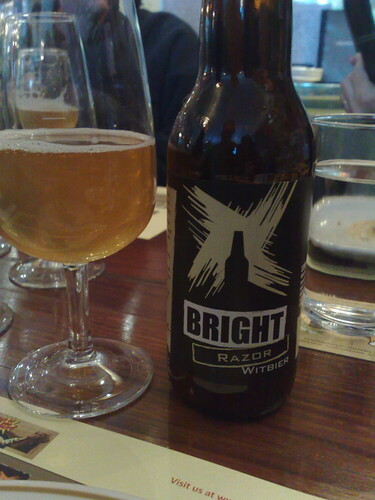 Two beers to go with the last two courses which were desserty – first the Sable Breton, my favourite course. These were just scrumptious! 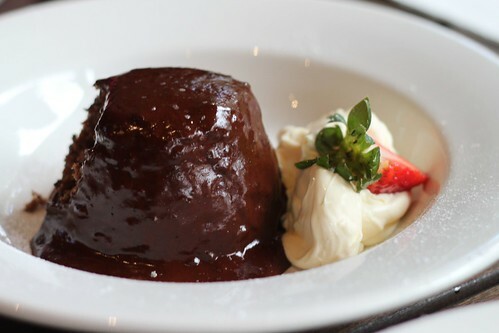 I found that the Holgate chocolate Temptress (a beer I could jolly well marry) went better with this than with the last course of Belgian waffles drowned in chocolate sauce. 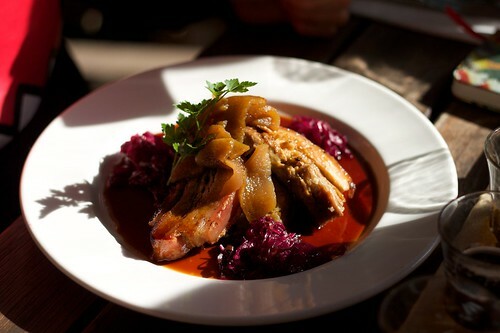 The richness of the Holgate and the fig were heavenly. 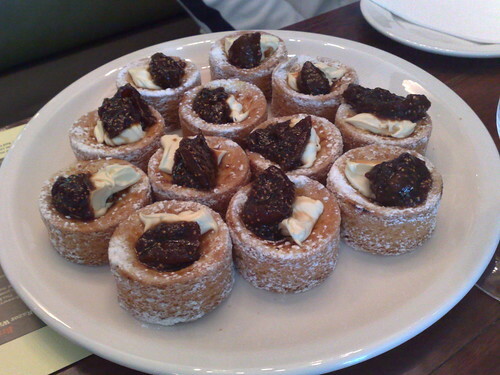 Technically, however, it was the White Rabbit dark ale that was served with these pastries. 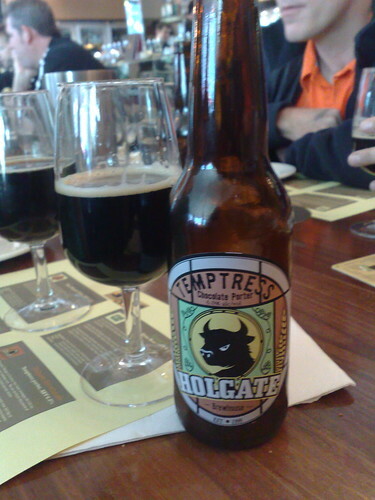 The White Rabbit dark ale is far more sessionable drinking than the Holgate which I love as an after-dinner beer. I’ve knocked down a few pints of the dark ale and have to confess…I’m a little over it – it was my least favourite beer at this event. 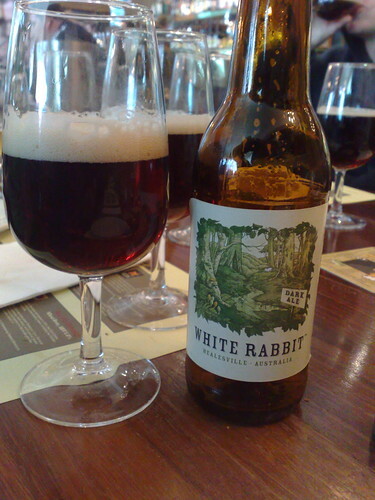 Good thing White Rabbit have a newly released white ale! 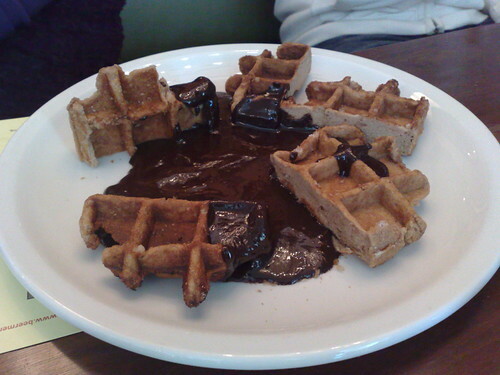 Everyone was a bit sozzled and full by the time the Belgian waffles in chocolate sauce came out. I still managed to force one down, hehe. A fantastic event. We were amply guided through the beer and food with good humour by our lovely hosts Mark, Damien and Todd and I even got to meet Mark briefly which left me starstruck for the day! 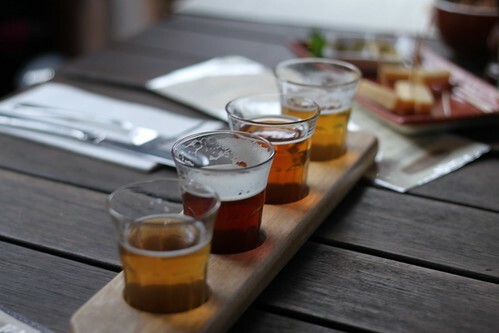 I think I would have liked the breakfast to be a bit more leisurely as we really were cramming down the food and beer pretty fast but that’s a minor issue – the staff at Beer Deluxe were flawless and our fellow diners were friendly and keen to share thoughts on the beer. It was twenty (yes, that’s all!) bucks well spent! I understand that the event was possible due to the extreme generosity of all brewers of the beers served and you could do no wrong to go out and get a 6-pack of any of these beers. I even got to chat to Tom from Mountain Goat and met James of Beer Bar Band for the first time – I swear this dude is my beer twin (we seem to love a lot of the same beers and have similar preferences). So guys, when’s the next one?! This entry was posted in craft beer goodness, eatie-foodies dining out and tagged Australian beer, Australian International Beer Awards, Beer Deluxe, beermen.tv, breakfast, Bridge Road Brewers, Bright Brewery, Federation Square, Holgate Brewhouse, Mountain Goat Brewery, Murray's Craft Brewing Co, Red Hill Brewery, White Rabbit Brewery on May 31, 2010 by gem.